Going all out with this promotional theme, this Estee Lauder Oversize Cardboard Bow kicks the prop up a notch or two or thee. With a cardboard representation of a Seasonal Gift Blow, there is no sagging or need for daily fluffing. The Cardboard bow stands straight and tall for days, weeks and even months. Consider from various points of zoom in the gallery of images. 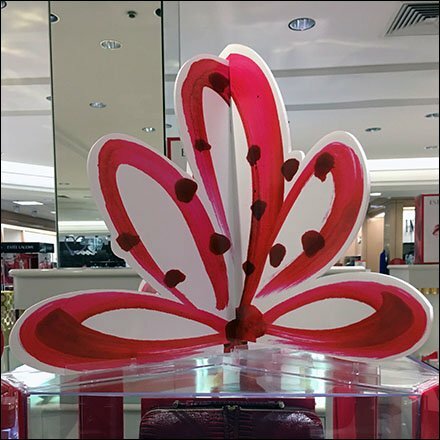 This Estee Lauder Oversize Cardboard Bow and other representations seen at Macy’s.